How many firms do have a so-called BPM office in place which coordinates and integrates process projects? This article discusses this question which was investigated by the process management survey. Survey details (research design, sample, etc.) can be found here. A business process management office, often also referred to as process office (Fischermanns, 2006) or business process management group (Harmon, 2007), coordinates and integrates process projects in the organization. 46% of the surveyed firms state that they have implemented a BPM office. 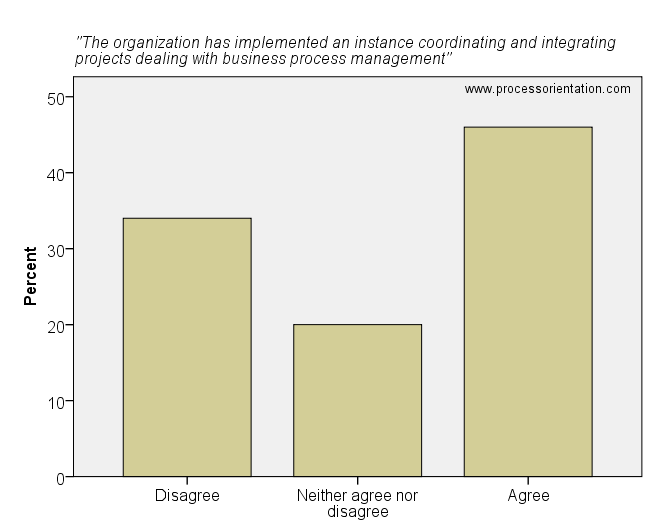 However, 34% of the firms state that a BPM office doesn’t exist in their organization. The organization has implemented an instance coordinating and integrating projects dealing with business process management.